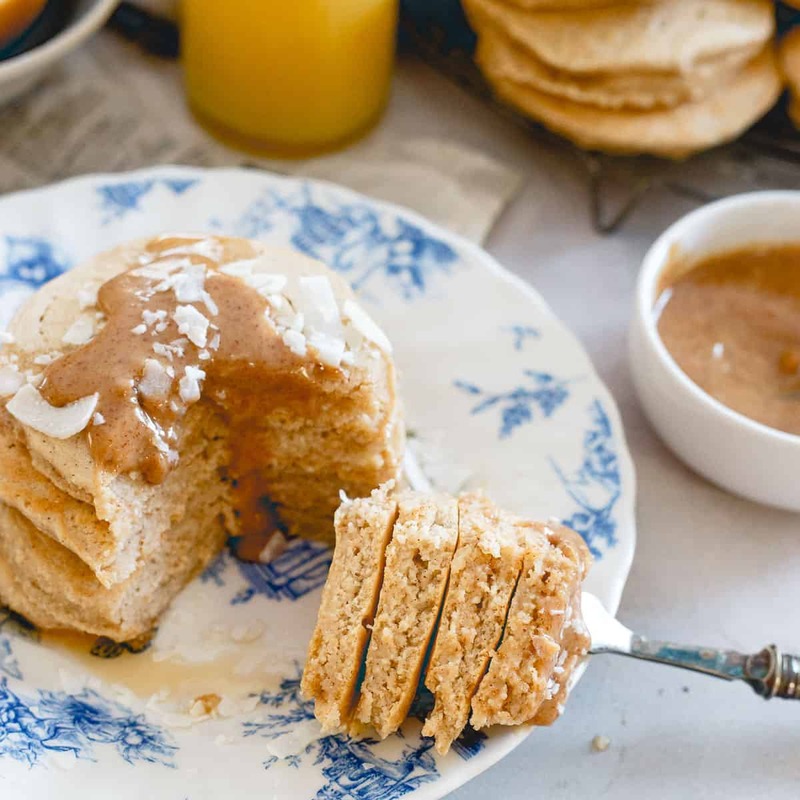 Doughy coconut flour pancakes with a coconut almond butter sauce are a simply delicious way to enjoy a pancake breakfast. *This post was originally published 1/23/2012. The content and photographs below have been updated. These coconut flour pancakes are an old recipe. Six years old in fact, originally published this month back in 2012. Usually, I leave the original text and just write a blurb about it being updated but this post was a hot mess of broken links and nonsense doing absolutely no justice to this wonderfully delicious stack of breakfast carbs. So, I’ll try to do better for my first post in 2018. Speaking of, Happy New Year! I would’ve called 2017 a great year until the last 45 days of it happened. Between losing our beloved Ginger, two trips to the ER for Ulysses, being sick myself for a week leading up to Christmas and seeing no family at all for the holiday because we were stuck at home while Ulysses worked Christmas Eve weekend, Christmas and New Years yesterday (his schedule is the absolute worst), I was happy to see the year go. That said, we brought Holly home 2 weeks ago so 2018 is already looking up (especially now that the housebreaking accidents have let up! *knocks on wood*). Not to mention, I’ll be back in Cabo, my happy place in 28 days soaking up that much needed Mexican sun and wearing something other than sweatpants. Trips to Barbados for my birthday in April and a bucket list trip to Peru in June are also happening this year. It’s going to be a great year of travel and hopefully a great year of eats on the Running to the Kitchen front. I decided to kick things off with one of my favorite from scratch pancake recipes that was hiding deep underneath horrible pictures in the archives back when coconut flour was still a relatively newish ingredient in the healthy food blogging world. I remember researching these pancakes wanting to use the brand new bag of coconut flour I had acquired but knowing it was a bit trickier than most flours out there. I think this recipe was only experiment 1 or 2 and it definitely set me up with a false sense of confidence in the coconut flour world. Don’t get me wrong, these coconut flour pancakes are perfection. There have been many coconut flour recipe fails that came after this that put me back in my place. Maybe it was beginners luck, maybe it was the fact that pancakes are a little more forgiving than other baked goods. Regardless though, I’ll take it because this stack is a definite favorite. 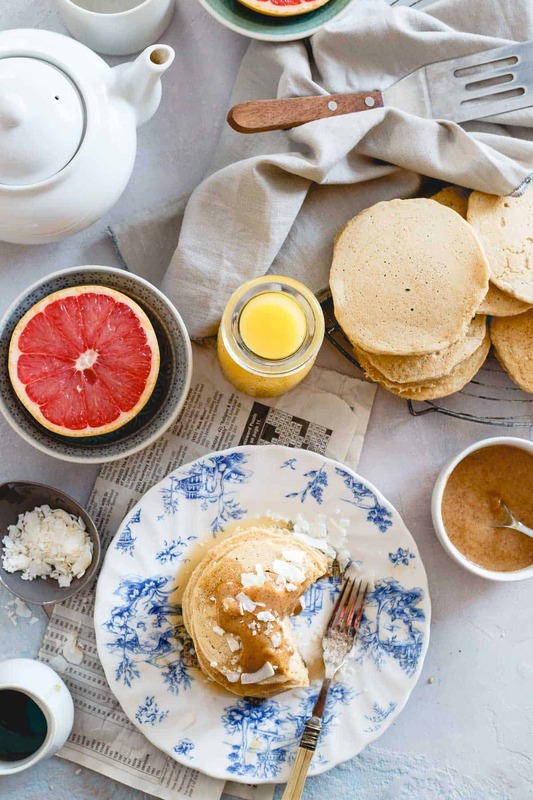 These pancakes are special enough (it’s the nutmeg) to feel fancier than your usual weekend breakfast stack but easy enough to make them your go-to recipe. 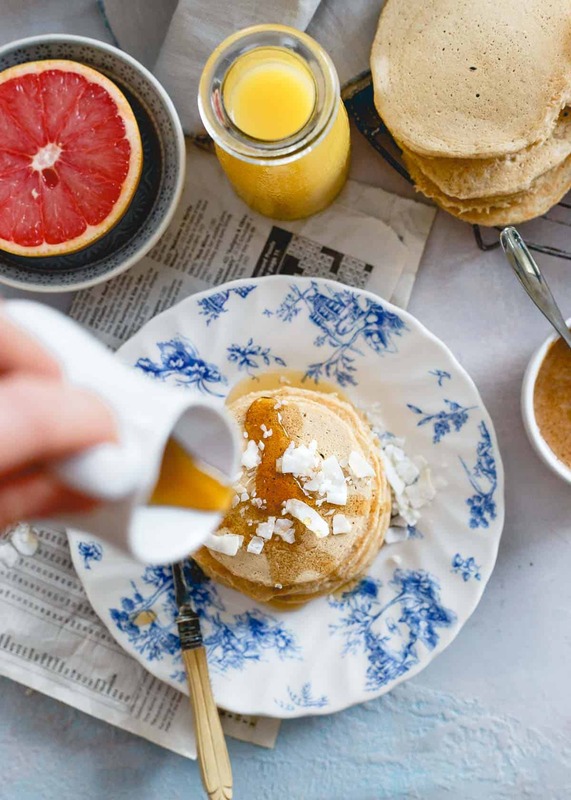 More pancake favorites: Banana Nutmeg Pancakes (<–a serious favorite if you have some extra time and want to make a really special spread), Apple Carrot Cake Pancakes with Maple Cream Cheese Topping or, Blueberry Avocado Pancakes (<– healthy fats and superfruit filled). 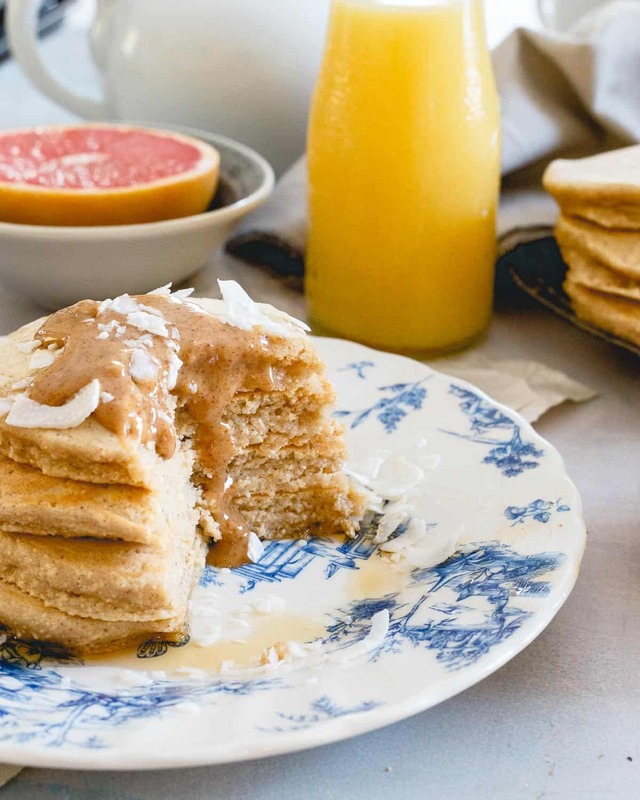 They’re doughy and moist, not as fluffy as a normal buttermilk diner pancake but not dense either (basically that sweet in-between spot) and if you serve them with the coconut almond butter sauce in the recipe, you’re sure to fall in love because it’s seriously finger-lickingly delicious. When I made these recently to re-photograph, Ulysses asked if he could have some (you know you’re a food blogger’s spouse when you ask before you eat…everything) and I turn around 10 minutes later after cleaning up to him polishing off 8 of these. This from the guy who prefers Trader Joe’s toasted coconut pancake mix to pretty much every pancake I’ve ever made. Now that I typed that, these are actually slightly similar in taste to those. 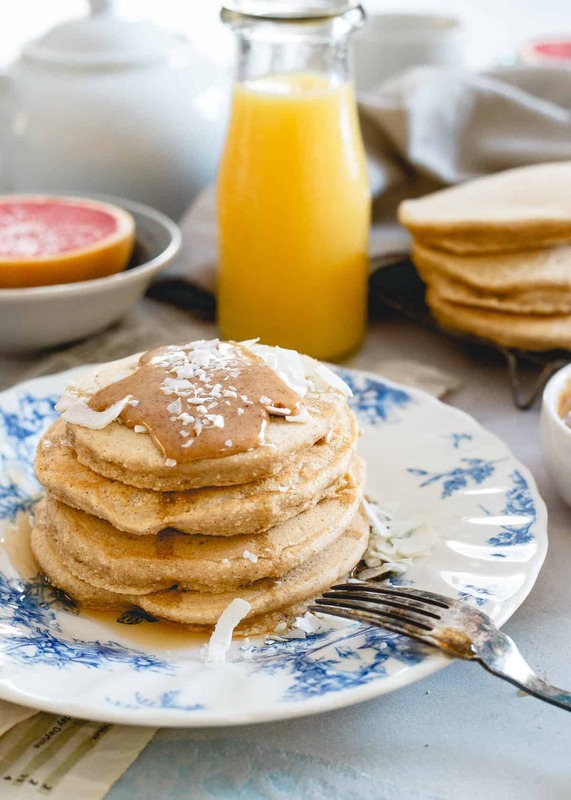 While I love these coconut flour pancakes, I have SO MANY pancake recipes on this site it’s really hard to choose a favorite. I think I’ll put these at the top of the list for the “alternative flour pancake” recipes. I just made that category up btw, it’s not really a thing but some others that would fall into it would be these pineapple buckwheat pancakes and these cinnamon raisin oat bran pancakes. Of course, you can’t forget these protein pancakes either for that group. Not only do they use almond flour and buckwheat flour, they’ve got 30g of protein per serving! 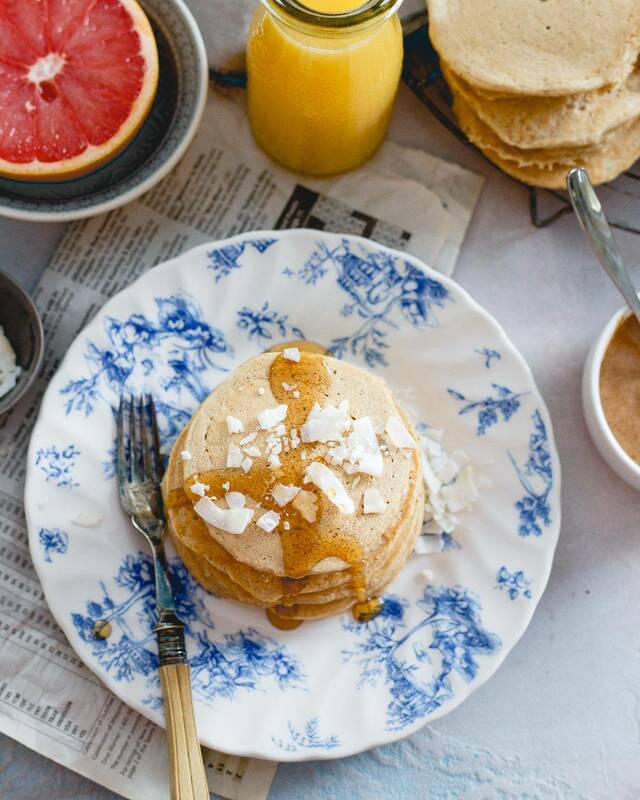 I don’t ever make resolutions in the New Year but I think I’m going to make a concerted effort to include these coconut flour pancakes in my weekend plans as much as possible in 2018. That’s a guarantee of good year to come! Whisk together flours, baking powder, cinnamon, nutmeg and salt in a medium bowl. Whisk together remaining wet ingredients in a small bowl. Heat a pancake griddle or pan over medium heat. Grease your pan with desired fat and spoon batter in about 1/4 cup measurements onto pan forming a circular pancake shape. Cook for about 2-3 minutes per side. Microwave for about 20 seconds. *I've also used oat flour and einkorn all-purpose flour successfully. These look so yummy and fluffy and the sauce – oy, the sauce! I’m making a date for these for tomorrow!! Oh man these look good. Bookmarked! I found coconut flour in natural food store it cost about $10.50, I went to look for cocoa nibs and found it in this store. I freaking love pancakes. Mike hates them, so, lately, whenever we go out to breakfast I order pancakes. It seems silly to make them for just one person if we’re at home. Ooooh heck yes. Aren’t they just delicious?! I am head over heals for coconut flour. I’ve been loving coconut flour recently! It’s extra wonderful mixed in to green yogurt with a bit of cocoa powder. Try it! That sounds different and interesting! I’ve never cooked with coconut flour– but these look like something I need to try!! Haha – I love all the pancake pics along the bottom in your “related posts.” So much warm, fluffy goodness! You are the pancake queen!! I would love to try coconut flour. I have been using oat flour for all of mine but I am on the quest for alternatives! Thans for sharing! Now my mouth is watering at work! WIsh I had a stack right now! Haven’t heard of coconut flower. I am sure I won’t find any here, in Fort Smith, AR. But I so want to try these pancakes… I think I am making a trip to the closest WF. Your photos are outstanding, by the way! Bob’s Red Mill makes it, that’s the only kind I can find around here. My selection is pretty limited too, no whole foods for at least 75 miles! My local natural foods store had it though. I forgot about my local store. Thank you! Coconut Flour! Yummm. These look so good and I am down for anything coconut! Yum! 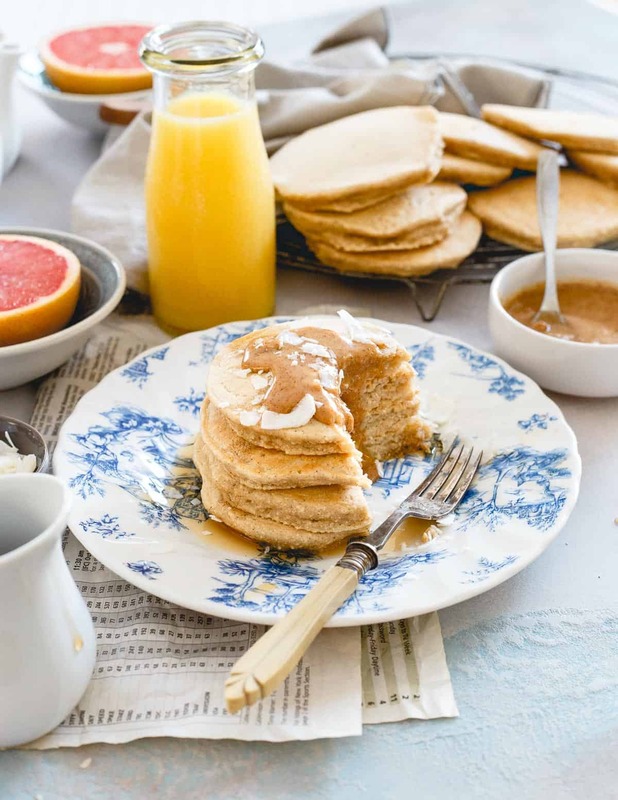 These look wonderful – I love the idea of coconut pancakes! I bet they would be great with a fruit salad. this makes me want to try out some different pancakes. I’ve been lazy lately and just been making either banana or blueberry. I need to switch it up some because not a weekend passes that I don’t have pancakes! I’ve never even heard of coconut flour, so excited to try these! So it’s like an oatcake batter? I can handle that!! Ages ago I made vegan/GF pancakes and used coconut flour and almond meal in them. The batter was SO THICK. Anything with coconut flour gets even thicker and then I had chia seeds in mine. Holy moly it was thick. These look great & a good way to use up the ton of coconut flour I have! Those look awesome! I really need to get some coconut flour! Mmm…coconut. Could coconut pancakes be coconut waffles. I am and always shall be a waffle fan. Ohhh, I don’t know! But I might have to try that out soon because I love waffles too. If you try it let me know. omg, yum!! i am obsessed with coconut milk and coconut oil but have never heard of coconut flour. how exciting! cannot wait to try these! I love making (and eating) different kinds of pancakes. These are a new one for me and they look great! I am always soooo nervous to cook with coconut flour – it’s very temperamental! I’m literally drooling. I really regret not picking up coconut flour last time I was at the store. I’m so used to rubbing coconut oil on my legs that I forget how amazing it is to cook with!! How does it work as a moisturizer? I’ve been thinking about trying it out because I currently spend a fortune on face moisturizer creams and I swear they don’t work! At least I could still use the coconut oil for cooking if it doesn’t pan out! I’m too scared to use it on my face but I’ve heard it works wonders! I only use it on my legs..I love it though!! I just use Trader Joe’s moisturizer on my face. These look delicious! I have a big jar full of coconut flour, and now I know what I’m going to do with it! Thanks for the recipe! I have coconut flour in my pantry and I have yet to use it. I was thinking pancakes, hmm, maybe this Saturday I’ll try your recipe. They look delish and I love the almond butter and coconut sauce. These look divine! I gotta make’em stat! I stumbled upon this recipe/blog from google while looking for something to make with my coconut flour. I have made them two times since then (and am actually eating some now, I’ve saved the left over batter in the fridge) and they are delicious! I can’t wait to try this recipe asap! Do you think I could sub whole wheat flour instead of spelt? YUM! These pancakes look delicious–so fluffy and sweet! Beautiful new photos, Gina! And so glad Holly is bringing you some brightness in 2018. Good riddance to 2017, I say. Looking forward to a fresh, delicious year! These sound amazing! A must try! I’m glad that 2017 ended with Holly at least. :) She is very cute. I’m enjoying all the IG stories with her. These pancakes look awesome. I am new to using coconut flour, and it definitely is tricky, I’ve found out. Maybe I will give these a go! Sounds like you’ve got a busy year planned Gina! Wish I had a few of those trips in my future! Love these pancakes. I tried making coconut flour pancakes a few months back and they were a total bust. I’ll definitely need to try your recipe! Happy New Year! You’re reminding me that I haven’t used coconut flour in ages! These look like the perfect way to break out my bag. It took my husband a while to get to the ‘ask before you eat’ stage but we’re finally there! I made brownies yesterday and the first thing he said when he saw them come out of the oven was: let me know when you are done photographing them. I’ve never baked with coconut flour (only coconut sugar) but I love the look of them so I’m definitely going to add these to my breakfast rotation. I’m so excited to try these pancakes and you already answered my question, oat flour is the option for me! I also love making my own coconut flour from the pulp of making homemade coconut milk, which I haven’t made for a while, I guess it’s time to make some coconut milk and coconut flour pancakes, yum!